No more confusion over which ball is yours. Quality personalized golf balls are printed with your name. Also makes a great gift for him. One name per pack of six solid core white balls. Specify name; limit 2 lines, 10 letters/spaces per line. This is a very great item for the golfer. I purchased them as a gift for that hard to buy for golfer. my friend loves the balls and uses them every day. Perfect gift for my grandson. Nice job on personalization! I bought two sets! Great gifts! Purchased for our grandson, an avid golfer!! These will be great on the golf course!! Very nice , I hope he like them! I Love all my items! My grandson will love them!! I should have odered more - they're perfect for the golfer ! Perfect for the golf lover in your life. Bought these for my stepdad for Christmas. Had his nickname added on them. Should have seen his face when he opened them. Definitely a unique gift. 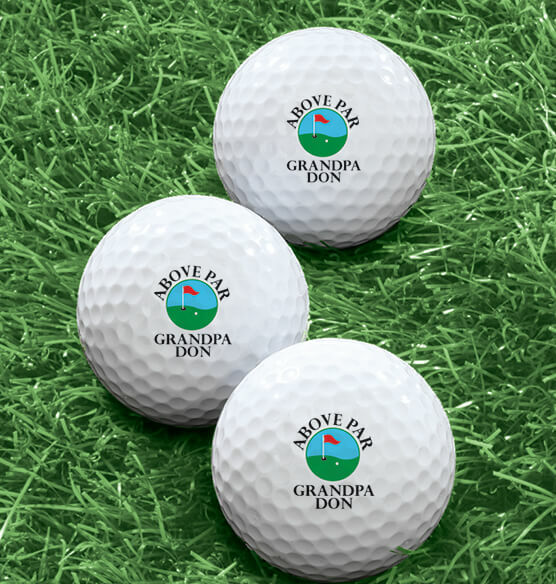 I bought these for my husband he really liked them with his name on them we went golfing and he used them and always knew it was his golf ball he really liked that, but after the game the name was hard to see but he still likes them . I thought they would make a perfect stocking present for my son. The only thing I didn't like was the size of the name that was printed. It needs to be a little bit larger especially if your only putting a first name. I wanted to surprise my hubby, but he just laughed At the golf balls and I felt embarrassed. He said, he loved the initials on the balls but it's too small and not readable anymore, cannot even put them on display. Miles Kimball should have add or printed their names as this is your product to look more better. Ball cracks open at first drive off tee. Inside: foam! The outer core disguises cheap foam inside. The intials are so small they are hard to see. They are a gift for my grandson but I doubt he will notice they are personalized. A great Christmas stocking idea. Men in my life that golf and hard to shop for. At least I know they will use these! Fun for Christmas for the three golfers in my life.